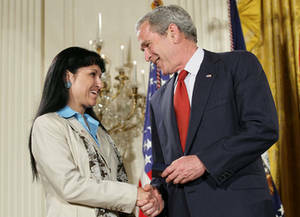 Description: Free picture of President George W. Bush giving remarks commemorating Military Spouse Day and Presentation of the President's Volunteer Service Awards. The photo was taken in the East Room (or Blue Room) at the Pentagon. Department of Defense photo, free to use.